I left work on Thursday, October 16, 2014 in a bit of a hurry. My wife Linda had suggested we go out to dinner and after a long week I was excited at the prospects of a date night. It had been a typical day at Charity Lutheran Church in Detroit. My assistant Denise Sanders and I had tutored about ten students from 3:00 to 6:00 pm while Pastor Essenburg busied himself cutting dozens and dozens of small PVC pipes (it seemed odd at the time, but I figured he had a reason). I pulled out of the parking lot of Charity, turning left to travel southwest on Kelly Road. Detroit has picked up rain every day this week, leaving a small pond of standing water on the road in front of Denby High School. Having dodged “Lake Denby,” I hit the speed dial on my phone and prepared to talk to my wife as I made my way home. Moments later, I came to the corner of Kelly and Hayes. As I approached the angled intersection, I noticed that southbound traffic was crawling. My first inclination was to find another route; I had passed a construction zone on Hayes as I drove to Charity, so I assumed that there was a backup due to orange barrels or a power outage. But as I waited at the light, I noticed the right lane was moving better than the left, so with no better option I made the turn. Once I was around the corner I immediately understood the backup. To my left, there were cars parked along the side of the road, in every driveway and even in the aforementioned left lane. There were also three vans from local television stations parked alongside half a dozen scattered Detroit police cruisers. One block down the road I saw that Mogul Street was blocked off with yellow tape. A throng of stunned onlookers were taking in the scene as several people I assumed to be detectives were talking beyond the tape. I described what I was seeing to Linda who began to check the TV and Internet for information. A few moments later, Linda read to me this story she found online. Four people had been shot. One of the four, a 3 year-old girl named Amiracle Williams had died at the hospital from a gunshot wound to the chest. As she read on, Linda explained that the first shooting had occurred at Denby High School. From there, the suspects traveled to this neighborhood south of the school. Denby High – just across the parking lot from where I had been helping children not much older than Amiracle learn how to form letters and multiply numbers. I went about the rest of my evening as previously planned; a nice dinner and a wonderful conversation with Linda, followed by a little work while emptying the DVR. My mind, however, kept flashing back to the events of the day. I considered the close proximity to my classroom, but thought much more about Amiracle. Thursday October 16, 2014 should have been nothing more than a typical day of play and discovery. Now it will be the end date on her headstone. But even more pressing than all of that was the question; was October 16, 2014 the day she ran into the arms of Jesus? I pray that it was, but while my ministry was working to make a difference in that community, I didn’t know Amiracle. It was at that moment I knew I would write about this, but for some odd reason I decided to go to bed, get up early and write about it in the morning. So this morning, Friday, October 17, I woke up ahead of the alarm and began to check messages prior to writing this post. 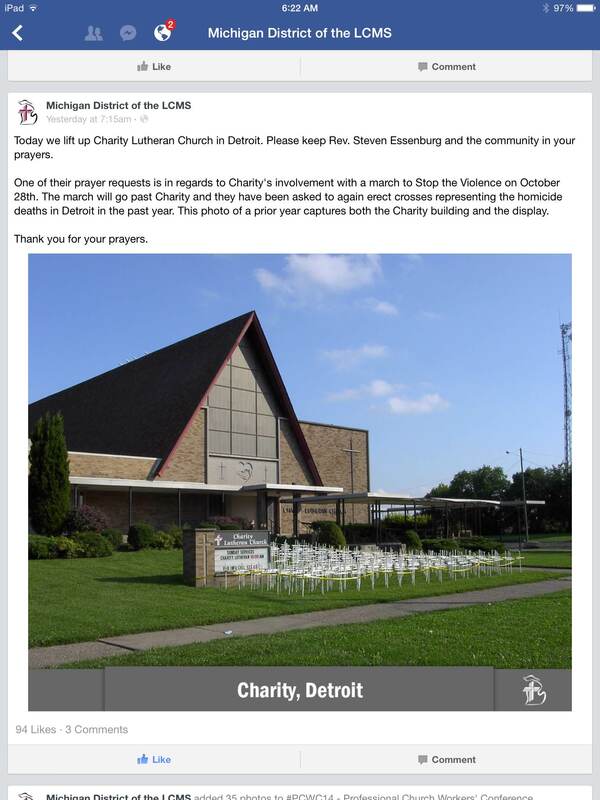 As I skimmed Facebook, I discovered a post from the Michigan District – LCMS that blew my mind. Am I suggesting that God knew what would be happening prior to the events of the day? Am I saying that He used Seth Hinz at the District office, convincing him to send out this message on the same day tragedy would strike the very community Charity is working to save? Am I claiming that the prayers lifted for this ministry by unknowing believers from across the state helped keep it safe yesterday with danger only yards away? Did those same prayers for the community also have the power to have kept others safe and possibly brought the love of Christ into the lives of the people involved in the tragedy? Thank you for the dedicated prayer warriors who lift up ministers, teachers, ministries and communities every day. You may never know the impact you have upon the people you support, but God does. His will is done with or without our speaking it, but your faithful support brings encouragement that makes the work that needs to be done possible. So join me in praising God for His blessings, or as Paul instructed the Romans, “Be joyful in hope, patient in affliction, faithful in prayer.” Continue to lift up the family of Amiracle Williams and everyone impacted by her senseless killing. Also keep Charity Lutheran and Pastor Steve Essenburg in your prayers in the coming days. Having seen the crosses on the lawn in the picture, his peculiar project suddenly made sobering sense. This entry was posted in Devotional and tagged A Mile in My Schu's, Amiracle, Amiracle Williams, Bible, Charity Lutheran, Christian Life, Christianity, Day 1 of 1, Denby High School, Detroit, Devotion, Devotional, Devotionals, devotions, God, God's Will, Gun Violence, Hayes Road, Jesus Christ, Kelly Road, LCMS, Life, Mogul Street, October 16, Prayer, Psalm 107:28-30, Religion, Richard Schumacher, Romans 12:12, shooting, Violence. Bookmark the permalink.